My Aunt Gladys was my Uncle Tommy’s wife. When they were dating I was a toddler and they liked to take me out with them. The story I remember most (probably because I heard it so often) is when they took me for an ice cream cone. As I recall, we were in a red car, with me in the front seat between them (back before baby car seats!) Into my hands they put an ice cream cone and as I tried to take a bite – plop! the ice cream scoop fell onto the seat. At this point in the story, my Aunt would be laughing; I don’t remember her caring about the mess – it was a story about having fun together. Early last Saturday morning I heard my cell phone ringing. It was my sister calling to tell me that my Aunt Gladys had died during the night. Neither of us knew that she had been in the hospital for heart surgery (which the Doctors thought was successful) and so we were (all) taken by surprise. Had I not been booked for an event tomorrow, I would have gone to the funeral. My cousin said, “Don’t worry about coming; she’s not here.” And I told him, “I know that. I wouldn’t be going for her – I’d be going to spend time with you and your family.” It seems that’s all we can do at times like this. Two days ago, in addition to my “pie of the day”, I baked a brownie pie with Cary’s Dark Chocolate Espresso Toffee and mailed it to my cousin’s family on Staten Island. It was my hope that it would arrive today and that the family would share it after the service. It was my way of “being with them” even though I am thousands of miles away. 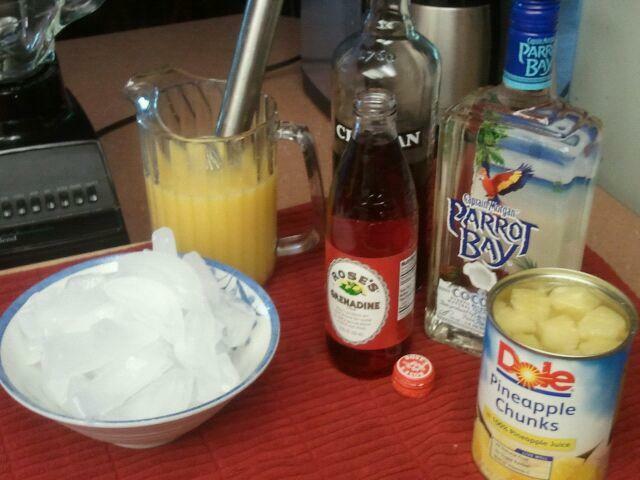 After the funeral today, in honor of my Aunt Gladys, my cousin served “Bahama Mama’s.” It is the kind of cocktail that my Aunt might have had on a special occasion. Yesterday, I went out and purchased the ingredients so that I could join my family in toasting my Aunt. I needed to share this moment with them; it is still hard to believe I won’t see her again. Combine all ingredients in blender and serve. ← Day 154: Happy Birthday Chris! I’m truely sorry for your loss — what a wonderful story of fun and caring with you and your Aunt Gladys. You have me remembering my own late Aunt and the fun times we had. The pie sounds delicious, but joining your extended family in toasting your Aunt is really inspired! and looks delicious! The star proverb is moving, too. Thank you for sharing with us. and even though it was a terrible time for all of us it was really good to see her after all these years.